Spring — the season of sakura (桜, cherry blossoms) — has finally arrived and the entire country has been transformed into a fairyland tinted pale pink. In a heartening season of renewal after winter’s chill, a wave of sakura washes over these islands. Usually the sakurazensen (桜前線, cherry blossom front）starts from southern Kyushu in late March before reaching Tokyo in early April and then northern Hokkaido in mid-May. Not only are there many varieties of sakura to enjoy in bloom at this time of year, there’s the much-loved custom of hamani (花見, flower-viewing) to indulge in, too. Though hanami translates literally as “flower-viewing,” and normally refers to admiring cherry blossoms, in practice it translates as drinking, eating and having a good time together with family and friends under the cherry trees. It is widely believed that the custom of viewing sakura began in the Imperial Court in Kyoto early in the Heian Period (794-1185). Before that, it seems that people were rather more partial to the blossoming ume (梅, plum) trees that had been brought from China and were a symbol of foreign culture. But when the practice of sending envoys to China was discontinued in 894, the court in Kyoto began to be more appreciative of local culture and things indigenous to Japan. With that, sakura trees gradually became more popular. But why has this delicate fluffy light-pink flower been so popular for such as long time? Generally, the transience of the blossoms, which last only a few days before falling, is said to strike a chord with the Japanese character. So, too, eating and drinking under the trees is associated with an ancient belief that the fallen hanabira (花びら, petals) that happen to land in sake cups promote good health. Rather less romantically, department stores and shops are now often decorated with cherry blossoms — more likely plastic than real — and at this time of year will have a section devoted to sakura-related products. Among these are many foods and drinks only available at this time. Perhaps the best known are sakura cha (桜茶, cherry blossom tea）— made by pouring a hot water over a salted cherry flower — and sakura mochi (桜餅, a sweet cake made of glutinous rice and sweet red beans that’s wrapped in a salted sakura leaf). In addition, special hanami bentō (花見弁当, boxed lunches for flower-viewing), menu courses, desserts and cocktails associated with sakura will be widely available. But Japanese don’t have a monopoly on the appreciation of sakura. Even first -time visitors to Japan will be touched to see blossoms drifting down in what’s known as a hanafubuki （花吹雪, shower of falling cherry blossom petals) and a chance to experience yozakura (夜桜, cherry-blossom viewing by moonlight or by the light of paper lanterns) should remain long in the memory. Although there are many renowned cherry-blossom viewing spots across the nation, before setting off to visit one be sure to check radio or TV reports so you can catch the trees at their best. In Tokyo, one of the most famous venues is Shinjukugyoen National Garden with its 1,500 cherry trees of 75 species. Ueno Park, Tokyo’s largest park, is now holding a sakura matsuri (桜祭り sakura festival), while Sumida Park along the Sumida River has more than 400 trees lighting up at night. For enthusiasts in Kyoto, the shidare-zakura (しだれ桜, weeping cherry blossoms) of Maruyama Park and Heian Jingu are a must. 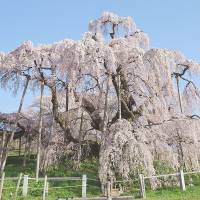 The best time for hanami in the former capital is from early to mid-April, with the famed yae-zakura (八重桜, double cherry blossoms) at Ninnaji Temple normally among the last to come into full bloom. While the sight of hundreds or thousands of cherry trees in full bloom together is a wonderful experience, around Japan there are also many beautiful ippon-zakura (一本桜, solitary specimens) well worth visiting. Among these, three in particular are normally singled out and called sandai-zakura (三大桜, best three cherry trees). The taki-zakura (滝桜, waterfall cherry tree) in Miharu, Fukushima Prefecture, is so called because the rose-pink blossoms on its mass of downward arching branches resemble a waterfall; while usuzumi-zakura (薄墨桜, light Chinese-ink color cherry tree) in Neo, Gifu Prefecture ,is believed to have been planted by an emperor 1,500 years ago and is famous for petals that gradually change from pale pink to the color of its name. 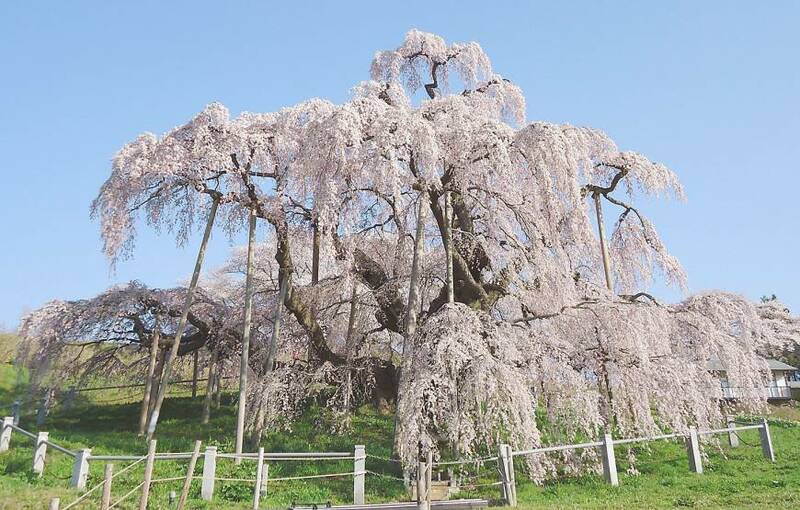 Finally there is the jindai-zakura (神代桜, mythological age cherry tree) in the precincts of Jisoji Temple in Mukawa, Yamanashi Prefecture, which is believed to be 2,000 years old and Japan’s oldest sakura. So wherever you go, whatever you do, be sure to enjoy the fleeting delight of the cherry blossom this season and hope the weather is kind, and hard rain and strong winds hold off to allow the trees to show their full splendor.